The Mobile SDK for iOS decreases your app's time to market by providing out-of-box support for LinkedIn natively inside your iOS applications, saving you time to work on the unique parts of your application that matter the most. Single sign-on (SSO) authentication, in conjunction with the official LinkedIn mobile application. Deeplinking to additional member content in the official LinkedIn iOS app. 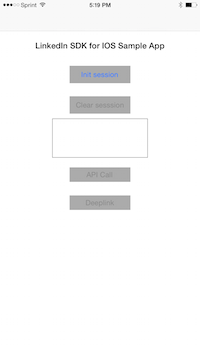 A sample application that demonstrates all of the SDK's features. This guide will introduce key SDK concepts and will walk you through getting the bundled sample application up and running. Ensure that you are running Xcode version 6.1.1 or greater in your development environment. Download the latest version of the LinkedIn Mobile SDK for iOS. Download and open the latest version of the LinkedIn Mobile SDK for iOS. Open either the eventsApp or SampleApp folder. Double-click on either the eventsapp.xcodeproj or SampleApp.xcodeproj file. Select Product -> Run from the top navigation. You should now be able to run the Sample App and Events App projects. Remember that the Mobile SDK-enabled applications require the official LinkedIn iOS app to be installed on the device to function properly. Finally, while the Sample App will run fine natively, if you want to run the Events App or any of your own projects, you must configure their package names and key hashes within your LinkedIn Application's configuration, as described below. If you have not already done so, create an application. If you have an existing LinkedIn application, configure it on the Developer website. Go to the the “Mobile” setting page, and configure your application’s Bundle ID value in your LinkedIn application settings. Associate your iOS application with your LinkedIn application by configuring your Bundle ID value(s) within your LinkedIn application. Multiple Bundle ID values allow a collection of applications (e.g. trial vs. free versions, a suite of related apps, etc.) to leverage the same LinkedIn application privileges and access tokens. Before you can make the necessary changes to your Info.plist file, you need to know what your LinkedIn application’s Application ID is. As seen above, it can be found on the “Mobile” settings page, listed directly underneath the “iOS Settings” header, within the application management tool. 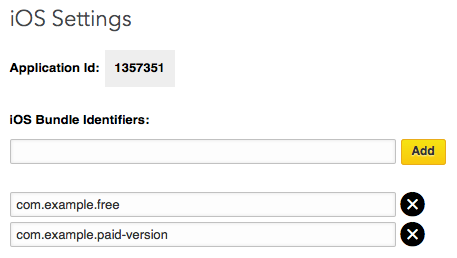 Locate the Supporting Files -> Info.plist file in your Xcode project and add the following values. Bitcode compiling for iOS 9 is supported as of version 1.0.7 of the SDK. As of iOS 9, Apple is enforcing the use of secure HTTPS connections between an app and server. If your application is exclusively making calls over HTTPS, you should have no compatibility issues. However, if your application needs to make requests to insecure HTTP endpoints, you must specify the insecure domain(s) in your app's Info.plist file. Please also consider taking a look at the sample application included with the SDK for complete functional implementation examples of all of the features outlined below. Open the Mobile SDK for iOS archive and drag linkedin-sdk.framework into the Xcode Project Navigator pane of your project. Once your users are authenticated and have authorized your application, you can easily make calls to LinkedIn's REST API on their behalf. The LISDKAPIHelper object provides helper methods for all of the necessary HTTP verbs, and will take care of ensuring the current user’s access token is applied to the request. To understand all of the possible API calls that can be made using these helper methods, please consult LinkedIn's complete REST API documentation . Make an HTTP GET request to LinkedIn's REST API using the currently authenticated user's credentials. If successful, a LISDKAPIResponse object containing the LinkedIn response will be returned. Make an HTTP POST request to LinkedIn's REST API using the currently authenticated user's credentials. If successful, a LISDKAPIResponse object containing the LinkedIn response will be returned. During your application's workflow, there may be occasions where you will want to cancel any in-progress API requests. This is made possible by calling the cancelCalls method. This method will open the currently authenticated user's LinkedIn profile. Users have the right to see more information about themselves than of other members. Although it will not fail, they may end up seeing less of their own profile information than possible if you send them to the LinkedIn application using viewOtherProfile with their member ID, rather than using this method. state - The state to return to your application when a user backs out of the LinkedIn application. showDialog - A boolean to determine whether the user should be presented with a dialog prompting them to go to the App Store if they do not have the LinkedIn iOS app installed. If false, they will be taken there directly, without prompt, if necessary. success - A handler method that is executed when the deeplink action completes successfully. error - A handler method that is executed if the attempt to deeplink fails. memberId - The ID of the LinkedIn member whose profile you want to send the user to. Storing member ID values on your own server allows your application to direct users to the official LinkedIn profiles for any other users that have authorized your mobile application. You will not be able to retrieve valid member ID's for anyone who has not previously authorized your application.